Greatwood was established in 1999 in fulfillment of a longstanding belief that a small business designing and making fine contemporary furniture to commission is a viable and worthwhile enterprise. In this frenetic 21st Century dominated by state-of-the-art electronic devices we offer a truly unique product, the existence and relevance of which is neither controlled by time nor current technology. 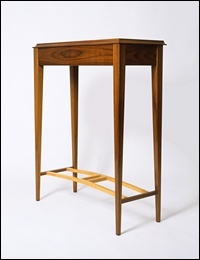 The origins and history of furniture are inextricably linked through the centuries with our own development. 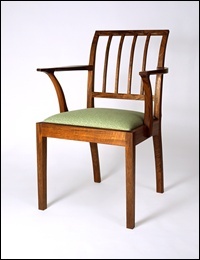 Furniture is interwoven with our history and is an expression of the human psyche prevailing at a particular time. It is made from our most natural and beautiful sustainable material. When finely crafted, its elegance, functionality and ability to constantly please will endure for generations, without the need for constant update or modification – just a little care. It is not surprising therefore that most of us have an innate empathy with fine furniture, which, unless awakened, may sometimes remain dormant. Through commissioning a piece of our fine furniture we hope to rekindle this innate connection. We provide an interactive means by which our clients, if they wish, can direct their own individuality into the piece, with the comforting assurance that we will always maintain the highest standards of traditional craftsmanship. There are many discerning people who have already recognised the benefits and pleasure of owning a commissioned piece of fine furniture. It is not the preserve of a few as some might assume, so please tour our website, which we hope you enjoy, and perhaps will inspire you to start imagining your perfect piece.